Update: Another option would be to attach to a thin board and frame! Also this was burlap from the garden section. The holes are are much larger then burlap you buy at a fabric store. I'm sure either on would work you may just end up with a little different finish. The size of the flag makes it the perfect statement piece for any room. 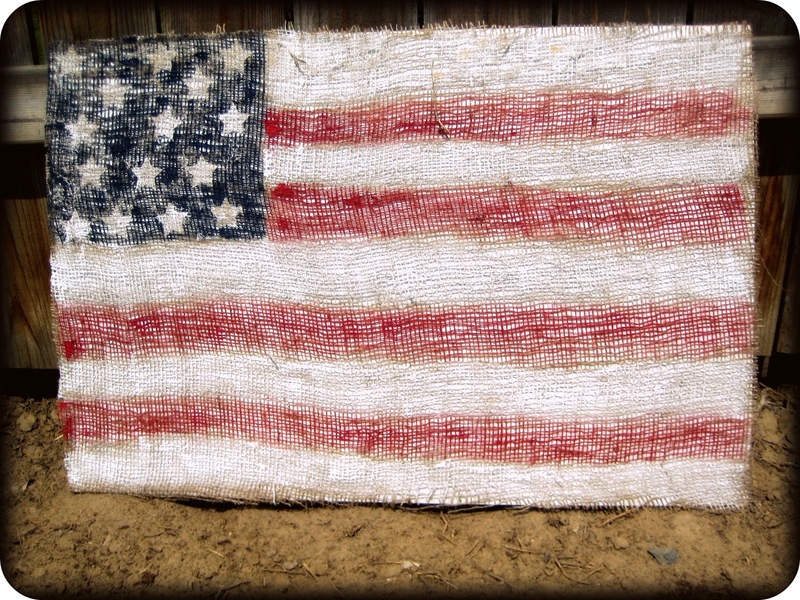 It is hand painted on burlap giving it texture and a more rustic and aged look. 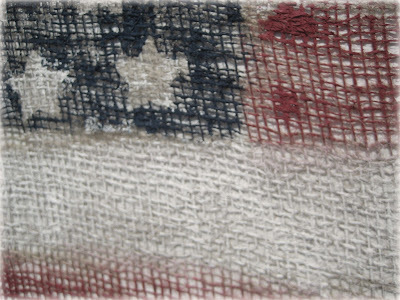 The burlap also gives the appearance of a painted canvas. Its new spot is in the living room surrounded by family photos and I can't think of a more appropriate place. 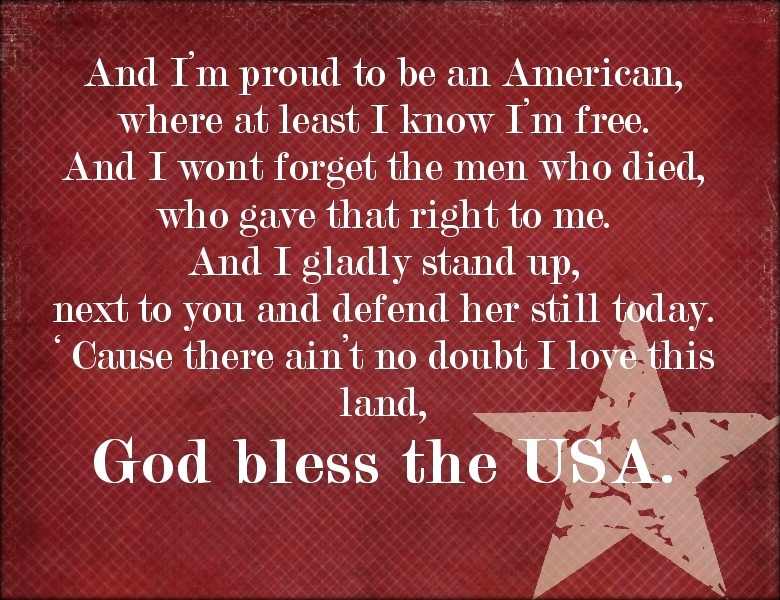 It reminds me of the love I have for my country and the gratitude I have for the heroes that fought and those that continue to fight for us. Its the perfect summer decoration or you could even use it year round. Start out with a foam board and cut a piece of burlap a little larger. Tape it in place. Paint your box for the stars white and they start painting stripes. Burlap was tough to paint. dab a little and then just keep brushing. You don't want to use too much paint at a time or you will end up with globs of paint like I did. Cut some stars out on contact paper and adhere where you want them. Paint your box blue. Once it dries peal off your contact paper and you'll have white stars. One it dries peel off your flag from your board (the paint makes it stick a bit). I flipped my board over because it made the large paint spots a little less noticeable. 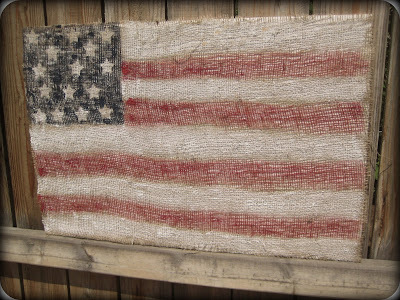 Spray your board with a spray adhesive and attach your flag. Trim the edges. 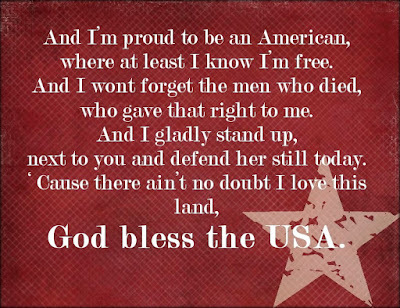 This is one of my favorite patriotic songs so I thought it would be perfect to add to my home. You are welcome to use this free printable if you would like. 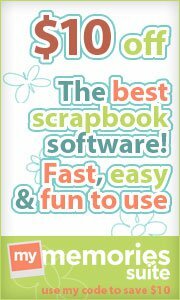 Right click and "save picture as" then print it out.